2. 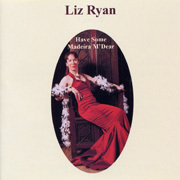 "Come to the Cabaret"
Liz's new CD "Have Some Madeira M'Dear" is now available. You can download the album or individual tracks from itunes by clicking here. See Liz on youTube. This is a link to one of Liz's YouTube videos. "Keeping it in the family"...This is a link to Liz's brother's "Myspace" site. It's a different style of music but it's original and it's worth hearing.